Still, serene, spiritual… this vast shimmering lake of blinding light and calm water is said in legend to be the birthplace of the sun. More certainly, Lake Titicaca is the highest navigable body of water in the world, its mirror-like deep blue water reflecting the sky. At 284m deep and more than 8300 sq km in area, it is fifteen times the size of Lake Geneva. The tranquil waters of the lake are disturbed only by a few vessels of tour operators and local fishermen searching for trout in wooden sailboats or rowboats. Not so long ago their boats would have been made out of the lake’s indigenous reeds, and today there are still a few craftsmen who retain the skills to make reed boats like their forefathers did. Since 1978 the lake has been a National Reserve, with over sixty varieties of bird, fourteen species of native fish and eighteen types of amphibian. The scattered human population is descended from two ancient Andean ethnic groups – the Aymara and the Quechua. There are more than seventy islands on the lake, the largest and most sacred being the Isla del Sol (Island of the Sun), an ancient Inca temple site on the Bolivian side of the lake. On the Peruvian side, your Mercury itinerary will take you for a visit by motorboat to the Islas de Los Uros (Uros Islands). These are the extraordinary floating platform islands made from the totora reeds that grow in the lake shallows, resembling large bales of hay and about 3m thick. They were originally created for defence purposes, enabling communities to escape from attacks from aggressive neighbours. Today the islanders make their living by fishing, hunting, cutting reeds, collecting eggs, trapping birds and, of course, selling visitors well-crafted miniature reed boats and other handicraft souvenirs. 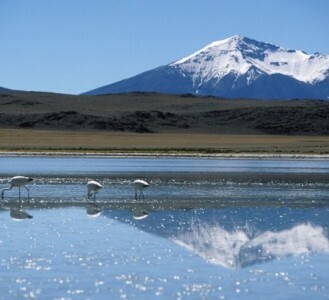 Depending on your itinerary there may also be a visit to Taquile, one of the lake’s populated natural islands. The landscape, with green terraces, bright flowers and the surrounding blue waters, is stunning. So are the views, especially from the top of Taquile, from where the snowcapped Bolivian mountains loom in the distance. 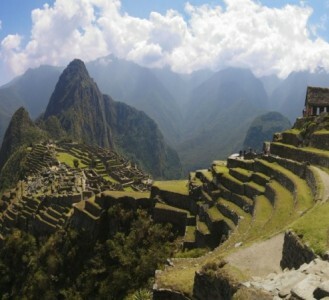 It’s well worth the effort to reach the top, where there are also Inca and Tiahuanaco ruins. The most popular way is to climb the 533 stone steps, or you can take a longer path. The island is inhabited by around 3,000 Quechua-speaking people. They grow crops on the pre-Incan terraces that cover its hilly terrain, and thanks to a largely vegetarian diet they’re reputed to live an average of 90-100 years! Their skills in weaving and knitting have earned Taquile and its textile art a UNESCO honour for “Masterpieces of the Oral and Intangible Heritage of Humanity”. The women do the weaving and the men do the knitting, skills learned from a tender young age. The hats they knit carry a message: a white hat means a man is single; a red hat signifies he is married. Whatver you choose to buy you can be sure it’s unique, because Taquile’s handicrafts are never exported and only sold on the island or presented as gifts.